Description: Farmland seen from an airliner. 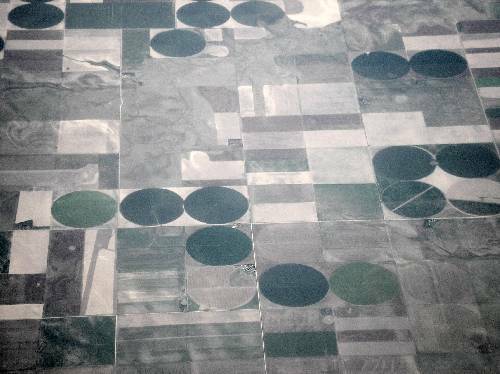 The circles you can see are irrigated crops being grown, they are called pivots. Center-pivot irrigation (sometimes called central pivot irrigation), also called circle irrigation, is a method of crop irrigation in which equipment rotates around a pivot. A circular area centered on the pivot is irrigated, often creating a circular pattern in crops when viewed from above. This page was last modified on 24 October 2017, at 09:37.